In the 17th century, physician and dean of the Land of Cuijk, Doctor Peelen, left his estate, chapel, court, and orchard to the Carmelites. In 1682, the groundwork began for a new chapel, with the entire “kloostercomplex” finished in 1720. By the end of the 19th century, Doctor Peelen’s old house became the noviate, or place where the training of the new sisters took place. One of the conditions of his will was that the nuns continue teaching young girls, but this became harder as the nuns aged. A solution was found in 1853 when nuns over at the nearby Weijer (now Boxmeer’s cultural center) took over the teaching duties so Elsendael could devote itself strictly to spiritual matters. Often castle hotels are located outside of towns, up hills, and alongside rivers, with public transportation options to get to them tricky or nonexistent. If you’d like to stay in a historic property that’s a five-minute stroll from the train station, this may be the place. Boxmeer is about half an hour south, southeast of Nijmegen. Exit from the A73 at Boxmeer. Free parking. Boxmeer also has a train station on the Nijmegen-Venlo line. The hotel is 500 m from the train station. Walk straight ahead on Bilderbeek Street and make a right on Dr. Peelenstraat. 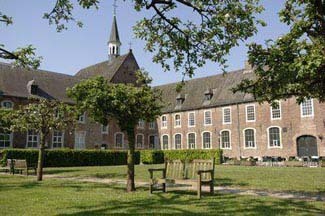 A serene and friendly atmosphere still prevail in this former convent situated right in the middle of the town of Boxmeer. Much of the original architecture has been retained throughout. Simplicity rules from the guest rooms to surrounding gardens. Guest rooms are thoroughly modernized and decorated in neutral colors, with hardwood floors and beamed ceilings. Beds are comfortable, although a double bed might be two twins pushed together. Amenities in the hotel give it a three-star classification. In keeping with Doctor Peelens wishes back in the 17th century, the property is still used for teaching. The ROC (Regionaal Opleidingen Centrum) Nijmegen, a Dutch educational institute runs training programs in the hospitality industry here, specifically the Cas Spijkers Academy for culinary arts. Cas Spijkers is a renowned Dutch chef if you’re not familiar with the name. You’ll see their work in action in the dining room. Menus do not exist, rather you’ll be asked what you do and do not want to eat, as well any special diet plans, leaving the result a grand surprise! The restaurant Proeftuin has an open kitchen with two flat screen TVs so you can watch your dinner in progress! For a small fee guided tours around the property with stories about its history are possible.